Louis Theroux is a journalist who excels at being awkward, white and affable. Actually, that’s unfair: he makes damn good television, and is always endearing while he does it. It’s just not clear to me that he’s personally responsible for much the unfolding drama, seeming ultimately like a professional, televised spectator. But that’s part of his charm: he’s the teddy bear of gonzo journalism (one could almost call his style “gonzo lite”). 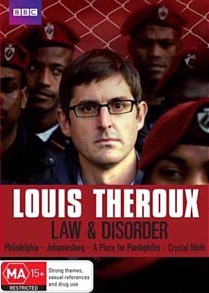 Louis Theroux: Law and Disorder is a play in four parts, the first of which is titled Law and Disorder in Philadelphia. The best descriptive short-cut here is to say that the denizens featured in this episode could have walked right off the set of The Wire. It’s truly uncanny. Philadelphia has one of the highest rates of violent crime in the US, and, of course, it’s all drug-related. We’re talking hazardous, gangster-ridden urban slums. Into this scene, we inject a polite, meek, and ultimately passive Brit, his glowing whiteness and quaint English idioms making him seem like a visitor from outer space. He tags along with police officers while they visit the scenes of shootings, bust low-level criminals for low-level crimes, and fail to make any measurable difference. The action is fairly intense, and yet there is no low budget shaky-cam. Nor is there any sensationalising. It’s all very matter of fact, and our hero does a very good job of observing it without collapsing into a gibbering mess. Theroux interviews cops, dealers, prostitutes and junkies in the most earnest and believing of manners. There is occasionally a hint of skepticism in his trademark pauses, but it very quickly becomes apparent that Louis’ M.O. is to say just enough to get the characters to share their perspectives. It’s minimalist interviewing, and it can be powerful – although sometimes you’d like him to be a little more probing and a little less accommodating when confronted with outrageous, bald-faced lies from drug dealers and violent criminals. Mercifully, there are no traditional moralising monologues as the episode winds up. Louis really does let everything speak for itself. And so you get a lot of guns, drugs, poverty and power squeezed into 55 minutes, and you aren’t spoon-fed an opinion on any of it. Questions of police corruption, ingrained futility, and moral equivalence between “the good guys” and “the bad guys” are raised, but they aren’t forced down your throat. Television should respect my intelligence like this at least a little more often. With the next episode, set in Johannesburg, we move eight or ten circles closer to the centre of hell. If the Philadelphia was depressing, the “Jo’burg” episode is televisual cyanide: the setting is apocalyptic and the characters alternate between personifications of hatred and despair. Viewers are treated to slums, guns, robbery, assault, mob violence and vigilante retribution. In an exceptional scene, it turns out that this is even getting to our unflappable Louis as well. “Jesus Christ”, he pleads, as an unofficial “police force” fires indiscriminately at people who could very well be criminals but are just as likely to be deeply unfortunate bystanders. This episode is a learning experience. Did you know, for instance, that buildings can be hijacked? Did you know that the police force in Johannesburg is so widely acknowledged as a joke-in-very-bad-taste that the community relies on a motley crew of unofficial law enforcers? (We would normally call these “gangs”.) Watch and learn as Louis proves that three feet beneath his bland face lurk some sizable cojones, as he parlays with severely unhinged “private police” who swear that really, honest to god, we didn’t kill that guy as an act of retribution, no sir we had nothing to do with that. The episode isn’t simply a black and white polaroid of a straightforward dystopia. Louis’ trademark interviewing style comes to the fore as he elicits dizzyingly nonsensical responses from the leader of a mob. Later on, not even our beloved Brit can keep neutral when a murderous thief tries to justify his trade. But whether it’s the thief, the private security forces, or the evicted girl describing an execrable slum as “a really nice place”, the helpless catch-cry of the episode is “What can I do?” This phrase is repeated many times by victims and criminals alike. Theroux offers no answer, and the viewer suspects there isn’t one. Next up is A Place for Paedophiles, set in a prison masquerading as a treatment facility. Coalinga Mental Hospital in California houses child molesters who have completed their jail terms but are detained further under the pretence of community protection. Disturbing as the inhabitants and their stories are, this episode is almost a relief. The facilities are clinically comfortable and sterile, and the inmates appear mild and spineless. The episode consists mostly of interviews (no firearms to provide any action here), and Theroux steps it up a notch by asking some difficult questions. Very quickly, however, the questions and answers become steeped in a vaguely cringe-worthy morass of pop-psychological and pseudo-medical terms that do a terrible job of camouflaging what is really endless navel-gazing from the “patients”, and thinly-veiled coercion and implausible mind-reading from the therapists. Take, for example, the revealing scene where a therapist decides that “being eliminated from a conversation” by an inmate demonstrates aggression and is “a form of abuse” – an act which might jeopardise his chance of release. All in all, A Place for Paedophiles is the most intellectually interesting episode, offering up complex characters and serious questions about the purpose of detention, the intractable problem of incorporating these demonised people back into the community, and the real value of what is questionably called “therapy”. Many of the interviewees are quite aware of these issues, and it is intriguing to hear their views. Having stepped further from the centre of the furnace, with the final episode we take a half step back towards it. In The City Addicted to Crystal Meth, the chemical whirlwind that is methamphetamine has torn through the Californian town of Fresno, and Louis surveys the wreckage of affected families (where “families” are as diverse as an incestuous couple, abandoned children forced to live with their grandparents, and a mother who can’t stay clean long enough to get any of her five kids back). Again, therapy rears its head. How could it not, when Fresno is home to one of the biggest rehab centres in the country? In some touching scenes, dedicated practitioners help endlessly relapsing addicts make some sense of their lives. Even if some of the group sessions do smell unpleasantly of Jerry Springer, and even if the addicts’ musings on their plight often seem weak-willed, it is impossible not to empathise and to ask yourself some serious questions. Fortunately, there are occasions where you can count on Louis to put these questions to the characters, such as when he tries to make sense of a couple that have been addicts through both decades of their reasonably happy marriage. The subject matter of these documentaries is reliably and incessantly captivating. The manner in which they are shot is satisfyingly anti-sensational, and the host has a curiously effective manner of allowing the issues (and the characters) to explore themselves. Most importantly, this collection is brilliant brain-food and excellent conversational fodder. It will show you proof of things that you would prefer not to believe in, and pose some problems that seem hopelessly insoluble. If that’s not a solid enough promise for you, I don’t know what else to tell you. Go watch Two and a Half Men.